"Guard the Good Treasure God Entrusts to You"
Here's a new hymn inspired by the first chapter of 2 Timothy. It is written in 10.10.10.4 and is sung to the tune, ENGELBERG which is commonly used to sing "When In Our Music God Is Glorified" or "We Know That Christ Is Raised." Permission is given for use in congregational worship. 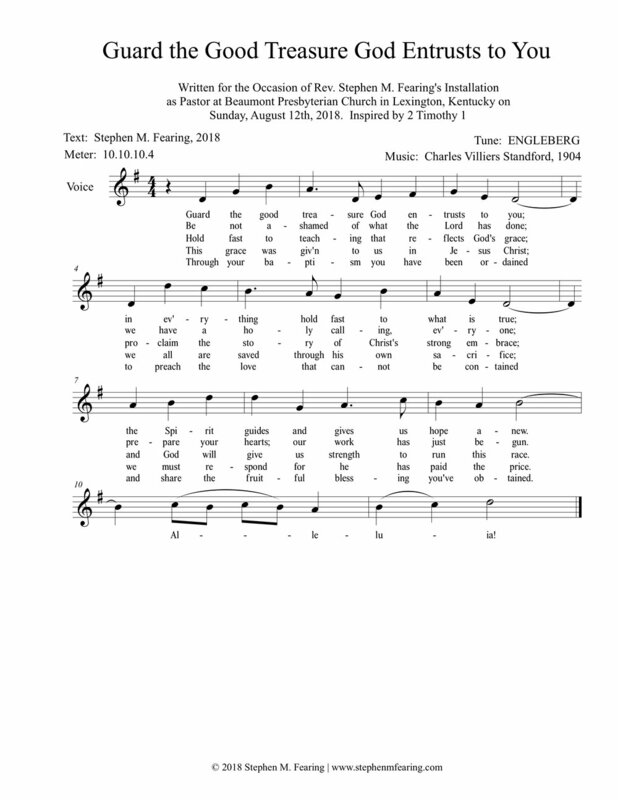 Please give the following credit: "Copyright 2018 Stephen M. Fearing | www.stephenmfearing.com"
Click here for a pdf of this hymn. The Spirit guides and gives us hope anew. Alleluia! Prepare your hearts, our work has just begun. Alleluia! and God will give us strength to run this race. Alleluia! We must respond for he has paid the price. Alleluia! and share the fruitful blessing you’ve obtained. Allelulia! "Keep Our Faith Alive and Thriving"